Say, what? Yup…you read that right. Why, you ask, would an atheist or agnostic know more about religion than a Christian? The L.A. Times interviewed Alan Cooper, the associate director for research at the Pew Forum, the organization that released this survey earlier this week and he answers this very question. He thinks the reason atheists and agnostics know more about religion than those who ascribe to those religious beliefs is because they are more likely to be people who grew up in a religious tradition and went through a process of reading, reflection and decision before leaving that tradition. In other words, atheists and agnostics are not in fact people who don’t want to hear about, read about, or understand the “Gospel.” Rather, they are people who have grappled with it in a more serious way than the average believer; their atheism and agnosticism is something they came to thoughtfully. The study also found a correlation between atheism/agnosticism and being well-educated. However, this is not to say that the most educated people became atheists and agnostics, since Christians with similar education levels still knew less about their beliefs than non-believers. Today, as a not-atheist-and-sort-of-agnostic-but-definitely-not-Christian, I can say, looking back at my former thought process, that I couldn’t be more wrong. I’m not interested in finding an excuse for sinning. I ate, drank, breathed and lived the Christian gospel for the first 30 years of my life and very thoroughly understand it. I have beyond-average knowledge of biblical facts and Christian theology. I wanted to believe it, more than anything I’ve ever wanted. When I say I’m not a Christian, this is not something I say lightly. It’s something I say a little sadly, because I wanted so much to believe it. I can’t. That’s not because I want to live in a certain type of “sinful” lifestyle and need to believe things that make that lifestyle o.k. If only it were that simple. My belief/unbelief came at a high cost. It’s something I wrestled with for decades. My saying that I’m not a Christian is very simply, honest. These days I’m reluctant to publically state that I’m not a Christian anymore, mostly because my hard-won belief/lack thereof is immediately written off by most Christians as “lack of understanding.” I can’t even explain the process I’ve been through without a Christian trying to “better explain” the Gospel in a condescending voice, no less. I’m not stupid, believe it or not, and neither are most other atheists, agnostics and otherwise “un-believing” folks. More knowledge about the Bible or Christian theology isn’t going to convince me to change my mind. That’s because, according to this survey, chances are I understand Christianity better than the average Christian does and, with brain intact, I’ve opted out. How do you score on religious knowledge? 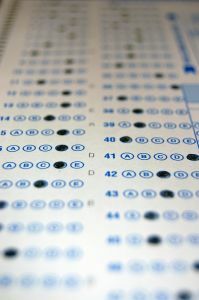 Take the Pew Forum Knowledge Quiz by clicking here.